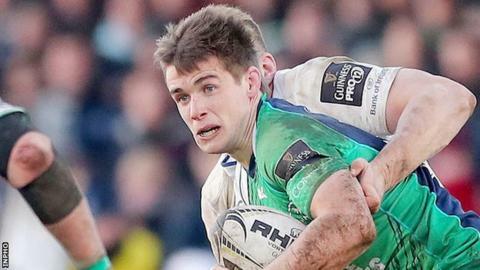 Pro12 leaders Connacht have a fly-half crisis ahead of Friday's game against Ulster after AJ MacGinty became their third number 10 to be ruled out. USA player MacGinty suffered a shoulder injury in Saturday's win over Leinster and will be out for around four weeks. Jack Carty is still out after having his spleen removed in February while Craig Ronaldson will be out for another three weeks because of an ankle injury. Ulster's Alan O'Connor will miss the game with Nick Williams also a concern. Lock O'Connor suffered a shoulder in Friday's defeat by Glasgow and looks in danger of missing the remainder of the season. Flanker Williams went off at half-time in Friday's game because of a shoulder problem and Ulster's director of rugby Les Kiss said on Monday that "it doesn't look good" for the New Zealander. Ulster's Ireland trio Rory Best, Jared Payne and Andrew Trimble were unable to feature at Scotstoun because of injury but could return for the Irish derby. MacGinty's shoulder injury means he is set to miss the Pro12 games against Ulster and Munster as well as Connacht's European Challenge Cup quarter-final against Glenoble. With MacGinty, Carty and Ronaldson all unavailable, former Glenoble player Shane O'Leary and Conor McKeon will be the candidates to start in the crucial fly-half role at Kingspan Stadium on Friday. O'Leary, 23, has made only one Connacht start, which came in a European Challenge Cup game, since joining the club from the French outfit in the summer of 2014. His eight appearances off the bench include six Pro12 games. Former Ireland Under-20 international McKeon has not started a Pro12 game with his appearances confined to replacement outings against Zebre last May and October. Ireland lock Ultan Dillane could return to Connacht duty after missing the win over Leinster but international prop Nathan White (concussion) and flanker Jake Heenan (ankle) are fitness doubts. Connacht go into Friday's game with a four-point lead in the table, while Pat Lam's side are 12 points ahead of fifth-placed Ulster. Sixth-placed Glasgow are level on points with Ulster and also have a game in hand on Les Kiss' team.